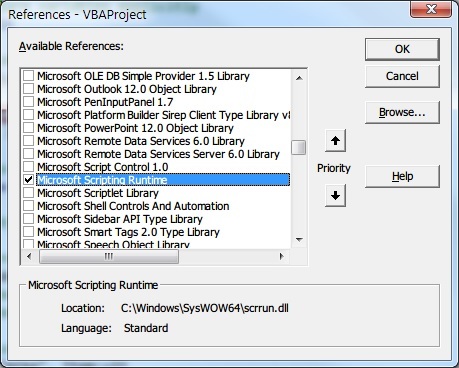 This post demonstrates dictionary object in Excel VBA (Visual Basic for Applications). A dictionary class is a data structure that represents a collection of keys and values pair. The key is unique (identical) in a key-value pair and it can have at most one value in the dictionary, but a value can be associated with many different keys. Add(key, item) - add a new key and item to the dictionary. CompareMode - set or get the string comparison method. Count ()- get the number of items in the dictionary. it is read-only. Exists(Key) -  determine if a given key is in the dictionary. Item(Key) - get or set the item for a given key. Items() - get an array containing all items in the dictionary. Key(Key) - change a key to a different key. 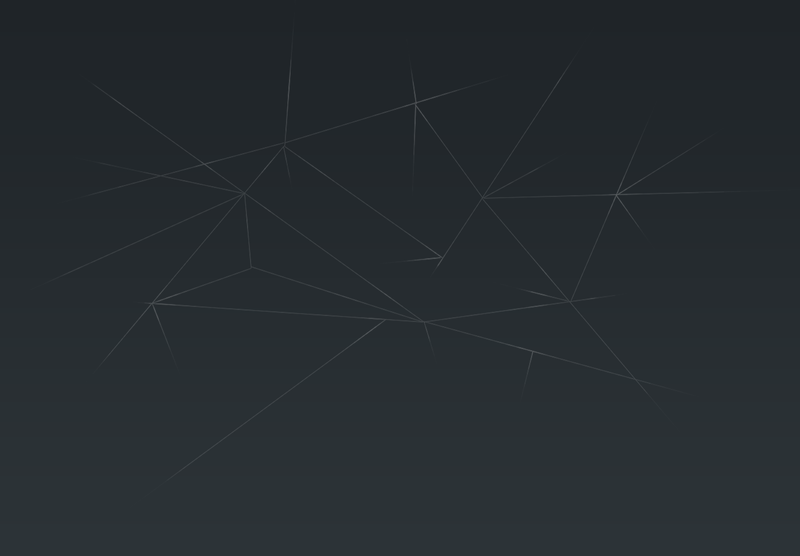 Keys() - get an array containing all keys in the dictionary. Remove(Key) - remove a given key from the dictionary. RemoveAll() -  remove all information from the dictionary. In the code window (Press Alt+F11 to switch between windows) -> Select Tools -> Select References -> From the list find "Microsoft Scripting Runtime" -> check it and Press "Ok". The following example illustrates the dictionary class and the members of dictionary. Debug.Print dict.Count & " Items in Dictionary"
There are three comparison modes available. By default the comparison mode is BinaryCompare. The other two are DatabaseCompare and TextCompare. Binary comparison is case-sensitive. So 'Mike' and 'mike' are different in the given example. 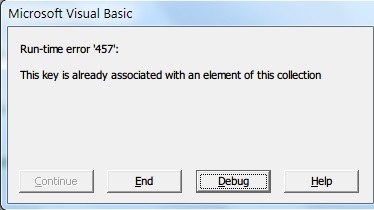 If you try to add the same key twice, you will encounter the following error message.